The Aegean Sea (Greek: Αιγαίο Πέλαγος (Aigaío Pélagos); Turkish: Ege Denizi, Adalar Denizi) is an elongated embayment of the Mediterranean Sea and an important natural feature of the Mediterranean region. The Aegean is located between the southern Balkan and the Anatolian peninsulas, between the mainlands of Greece and Turkey, respectively. In the north, it is connected to the Marmara Sea and the Black Sea by the Dardanelles and the Bosporus. The island of Crete is generally considered as marking its southern boundary. Roughly 380 miles (612 km) long and 186 miles (299 km) wide, the sea has a total area of nearly 83,000 square miles (215,000 square km). Approximately 1,400 islands and islets dot the Aegean—generally arranged into seven principal groups—the majority of which fall into the jurisdiction of Greece, while the remainder belong to Turkey. The Aegean Sea was known in Ancient Greece as Archipelago, meaning "chief sea." The multitude islands of the sea became its description, and the word archipelago came to mean a large group or chain of islands. The early Aegean civilizations of Crete and Greece, from which much of modern Western culture is derived, are a part of the Aegean legacy. In ancient times there were various explanations for the name Aegean. It was said to have been named after the Greek town of Aegae, or after Aegea, a queen of the Amazons who died in the sea, or Aigaion, the "sea goat," another name of Briareus, one of the archaic Hecatonchires, or, especially among the Athenians, Aegeus, the father of Theseus, who drowned himself in the sea when he thought his son had died. A possible etymology is a derivation from the Greek word αἶγες—aiges = "waves" (Hesychius of Alexandria; metaphorical use of αἴξ (aix) "goat"), hence "wavy sea," cf. also αἰγιαλός (aigialos) "coast." In the Bulgarian language the sea is also known as White sea (Бяло море). According to legend, Bulgarian sailors and merchants in the Middle Ages found it a hospitable and timid sea to travel and called it "White sea" in contrast to the hostile and dangerous Black Sea. The Aegean Sea covers approximately 214,000 sq km (82,625.86 sq mi) in area, and measures about 610 kilometers (379 mi) longitudinally and 300 kilometers (186.4 mi) latitudinally. The sea's maximum depth is 3,543 meters (11,624 ft), east of Crete. Mainland Greece is on the west and north and Turkey to the east of the Sea, while the island of Crete delimits the sea to the south. The ancient name of the Aegean Sea, Archipelago, was later applied to the islands it contains and is now used more generally, to refer to any island group. The bays and gulfs of the Aegean beginning and the South and moving clockwise include on Crete, the Mirabelli, Almyros, Souda and Chania bays or gulfs, on the mainland the Myrtoan Sea to the west, the Saronic Gulf northwestward, the Petalies Gulf which connects with the South Euboic Sea, the Pagasetic Gulf which connects with the North Euboic Sea, the Thermian Gulf northwestward, the Chalkidiki Peninsula including the Cassandra and the Singitic Gulfs, northward the Strymonian Gulf and the Gulf of Kavala and the rest are in Turkey; Saros Gulf, Edremit Gulf, Dikili Gulf, Çandarlı Gulf, İzmir Gulf, Kuşadası Gulf, Gulf of Gökova, and Güllük Gulf. Aegean Sea Islands map showing island groups. The Aegean Islands are found within its waters, with the following islands delimiting the sea on the south (generally from west to east): Kythera, Antikythera, Crete, Kasos, Karpathos, and Rhodes. The word archipelago was originally applied specifically to the Aegean Sea and its islands. Many of the Aegean Islands, or chains of islands, are actually extensions of the mountains on the mainland. One chain extends across the sea to Chios, another extends across Euboea to Samos, and a third extends across the Peloponnese and Crete to Rhodes, dividing the Aegean from the Mediterranean. 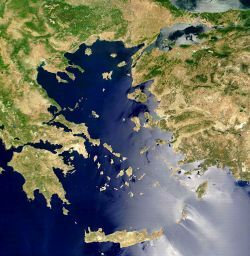 The Aegean Sea has about 1,415 islands and islets, the majority of which politically belong to Greece. 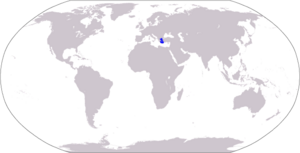 Turkish possessions include Imbros (Gökçeada), Tenedos (Bozcaada), and eight more islets off Turkey's western coast. Many of the islands are volcanic, rocky, and quite barren. Marble and iron are mined on some islands. The larger islands have some fertile valleys and plains which produce figs, honey, mastic, minerals, oil, raisins, vegetables, wheat, and wine. Fishing is also important. Monuments of ancient civilizations that flourished in the area attract tourists. Aegean surface water circulates in a counter-clockwise gyre, with hypersaline Mediterranean water moving northward along the west coast of Turkey, before being displaced by less dense Black Sea outflow. The dense Mediterranean water sinks below the Black Sea inflow to a depth of 23-30m, then flows through the Dardanelles Strait and into the Marmara Sea at velocities of 5-15 cm/s. The Black Sea outflow moves westward along the northern Aegean Sea, then flows southwards along the east coast of Greece. The physical oceanography of the Aegean Sea is controlled mainly by the regional climate, the fresh water discharge from major rivers draining southeastern Europe, and the seasonal variations in the Black Sea surface water outflow through the Dardanelles Strait. Aegean Sea Surface Water—40-50 m thick veneer, with summer temperatures of 21-26°C and winter temperatures ranging from 10°C in the north to 16°C in the south. Aegean Sea Intermediate Water—Aegean Sea Intermediate Water extends from 40-50 m to 200-300 m with temperatures ranging from 11-18°C. Aegean Sea Bottom Water—occurring at depths below 200-300 m with a very uniform temperature (13-14°C) and salinity (39.1-39.2 percent). "Aegean civilization" is a general term for the Bronze Age civilizations that developed in Greece and the basin of the Aegean sea between 3000-1200 B.C.E. 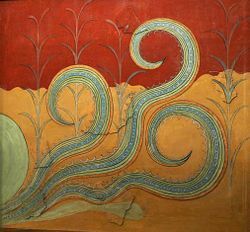 While ancient Greek writers recounted stories of heroes, little was actually known about the Aegean civilization until the late nineteenth century. In ancient times the sea was the birthplace of two ancient civilizations—the Minoans of Crete and the Mycenean Civilization of the Peloponnese. Later arose the city-states of Athens and Sparta among many others that constituted the Athenian Empire and Hellenic Civilization. In other words, there were three distinct regions covered by the term, Aegean Civilization: Crete, the Cyclades and the Greek mainland. Crete is associated with the Minoan civilization from the Early Bronze Age, while the Cyclades and the mainland have distinct cultures. The Cyclades converged with the mainland during the Early Helladic ("Minyan") period and with Crete in the Middle Minoan period. From around 1450, the Greek Mycenaean civilization spread to Crete. Crete may have acted as a cultural bridge, since the culture and civilizations that evolved there appear to have engaged in commerce with a number of different centers, such as Ancient Egypt and the Middle East. The Aegean region was later invaded by the Persians and the Romans, and inhabited by the Byzantine Empire, the Venetians, the Seljuk Turks, and the Ottoman Empire. The Aegean was the site of the original democracies, and its seaways were the means of contact among several diverse civilizations of the Eastern Mediterranean. 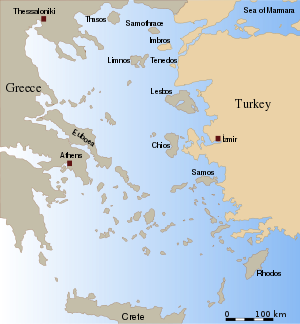 Commonly referred to as "the Aegean dispute" are a set of interrelated controversial issues between Greece and Turkey over sovereignty and related rights in the area of the Aegean Sea. The current dispute surrounding the Aegean has deep-seated historical roots that are tied to issues of territorial sovereignty. Past conflicts between Greece and Turkey, exemplified by the war fought from 1920 to 1922, have created high levels of distrust between the two nations. Since 1998, the two countries have been coming closer to overcome the tensions through a series of diplomatic measures, particularly with a view to easing Turkey's accession to the European Union. However, as of 2018, differences over suitable diplomatic paths to a substantial solution were still unresolved. ↑ A.E. Aksu, D. Yasar, P. J. Mudie, and H. Gillespie, Late glacial-Holocene paleoclimatic and paleoceanographic evolution of the Aegean Sea: Micropaleontological and stable isotopic evidence, Marine Micropaleontology 25(1) (April 1995): 1-28. ↑ D. Yagar, Late glacial-Holocene evolution of the Aegean Sea, Ph.D. Thesis, Inst. Mar. Sci. Technol., Dokuz Eyltil Univ., 329 (Unpubl). ↑ Tracey Cullen, Aegean Prehistory: A Review (Archaeological Institute of America, 2002, ISBN 978-0960904259). Kormondy, Edward John. Readings in Ecology. Prentice-Hall biological science series. Englewood Cliffs, NJ: Prentice-Hall, 1965. Miller, Helen Hill. Bridge to Asia; the Greeks in the eastern Mediterranean. New York: Scribner, 1967. Sansal, Burak. Seas of Turkey. All About Turkey. Retrieved September 17, 2018. United States. Aegean Sea Region. Washington, DC: Central Intelligence Agency, 2006. This page was last modified on 23 March 2019, at 15:48.